Bat Lady Herbals: "Natural Flavors"
I truly believe in the effectiveness of a whole foods diet, and that we should do our best to avoid processed foods. However, even products that we may think of as whole foods based (such as orange juice) have interesting ingredients. Realizing this has made me start to read labels more and more. Something I've noticed is that lots of food have “natural flavors” on their ingredients lists. In fact there are quite a few statistics showing that “natural flavor” is the 4th most common ingredient in most foods. However, very few of these actually let us know what food these flavors come from. So I decided to do a little bit of research and here's what I found. The FDA has released several statements about “natural flavors.” One of these says that “for purposes of ingredient labeling, 'natural flavors' means flavor constituents derived from a spice, fruit or fruit juice, vegetable or vegetable juice, edible yeast, herb, bark, bud, root, leaf or similar plant material, meat, seafood, poultry, eggs, dairy products, or fermentation products from these foods.” In short, the material must come from a plant or animal. So far it sounds good. Right? Here's where it starts to get interesting. “natural favors” don't have to come 100% from a plant or animal. 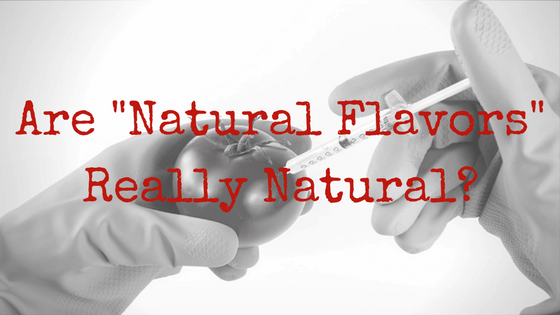 In fact, most of these “natural flavors” are made up of 50-100 different compounds, many of which are synthetic. These synthetic chemicals play different roles in the make up of the “natural flavors,” such as solvents, preservatives, and flavor modifications. In fact, most “natural flavors” are mostly made up of these chemicals. Mostly it comes down to consistency. Each orange tastes slightly different from the last. One might be sweeter, one more tart. But when companies have a product that includes these oranges (like orange juice), they want their product to taste the same every time. This is where “natural flavors” come in. Companies add these flavors to their product to ensure a consistency of flavor. One of the other reasons these companies add flavors to their foods has to do with making more money. They want to create repeat consumers. In order to do that, they have to find a way to get us to consistently choose their product over their competition's product. Making the flavor more intense is one way to do that. The FDA does not require companies who use “natural” or even “artificial flavors” to label exactly what is in these flavors. This can be pretty dangerous for people with certain allergies and/or sensitivities. For instance, I have a good friend who is horribly allergic to capsaicin (a chemical found in peppers of all kinds). Paprika is basically smoked, and ground peppers. It's also a spice that is commonly used in the creation of certain “natural flavors.” My friend should not be eating food that includes “natural flavors” made with paprika. However, many companies do not even add allergy warnings for capsaicin like they do for soy, milk, peanuts, etc. In short, we don't know what's in our food when we see "natural flavors" listed in the ingredients. I hope I have raised your awareness of “natural flavors” and how big businesses might be hiding synthetic ingredients in their food. If you have any questions or comments please leave them below. My family has always been skeptical about this. However, I don't believe there is much we can do about it, other than to consume it. Alternates are rarely available, and to change the rules, mass is required. There are some good natural alternatives out there, but they won't taste exactly the same. Largely because our food has been modified over the years to have more and more sodium and sugar content than what is really necessary. The best option is to make as much as you can at home. However, that is very impractical for many people.